The SUV market is getting stronger in terms of sales and demand. Be it in the normal passenger vehicle segment or in the Luxury car segment. All three manufacturers from Germany have taken up the mantle to deliver the same along with other iconic manufacturers. BMW has had a small line up of SUV’s but it has refreshed them from time to time. X3 is the most popular and once a upon a time, it was the best and the highest seller. Highest seller trophy now goes to the X1 because its more approachable. 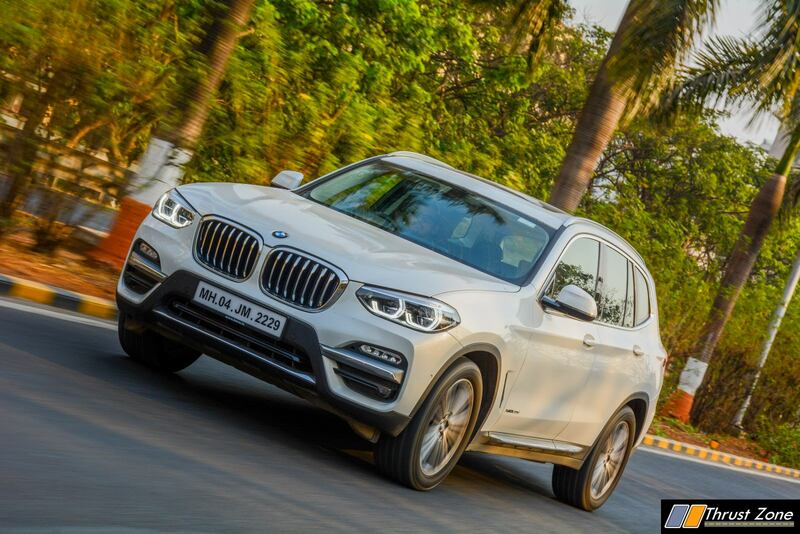 X3 remains the true blue SUV from the brand and hence it has some serious fan following. In this new generation, BMW has taken up the game by a big margin as it deliveries a X3 which is very promising. How is it? Let’s find out. The design includes new stubby elements such as the grille and headlamp which along with a big bumper look proportionate. 3 quarter angle gives it a crossover look. Side and rear profile viewing angle gives it a butch SUV stance. The flowing and Asian inspired tail-lamps at the rear with European illumination looks good. Large alloy wheels of 17-inch and above add stance to the vehicle which is SUV-ish. Overall, the best looking SUV without loosing lineage till date. Interior has seen a massive change as the dashboard has been revised. The use of wood, leather, brushed aluminium up front adds a luxury feel at first glance. Big bolstered seats with full leather also add premium-ness to the cabin despite dark color in our test car. The new layout for radio and a/c controls along with a new dial which is an LCD screen is most welcome. Space in the front and rear is adequate. Be it leg, knee, shoulder or head room. Under thigh support is good too. Seats are reclineable at the rear. 3-zone climate control, ambient lighting, start-stop button, automatic IRVM and ORVM with heating function, panoramic sunroof, Apple Car Play, Adaptive LED Lights, LED fog lamps, premium Harmon Kardon sound system, front and rear parking sensors, rear view camera, connectivity option, 10.25 inch touch screen, highly intuitive iDrive, electric parking brake, parking assist, TPMS and wireless charging is on offer. The safety kit includes 8 airbags, ABS, EBD, traction control, DSC, CBC along with ISOFIX and 3 point seat belts for all four seats. The engine on test this time was the 2.0 litre 190 PS and 400 Nm of torque producing diesel motor. The engine has been revised for the X3 and comes mated to an smooth, fast and slick shifting 8-speed gearbox. There are four driving modes such as Eco Pro, Sport, Comfort and Adaptive. The engine is smooth, free and quick revving. The low and mid-range punch is very good despite the heft the SUV carries. Top-end is good too, but it slightly stressed at Autobahn speeds, not Indian expressway speeds where it is comfortable all the time. At redline the engine can sound a bit coarse, the NVH can get higher but only at high speeds. Medium to low speed, NVH is very well controlled. Be it wind or tyre noise as well. 0-100 km/hr comes in 7 second which is on par in this segment and slightly higher than some rivals. The engine continues to be the one of the best returning stellar fuel economy and performance at the same time. Dynamics of this new generation X3 have been taken to an whole new level. The SUV feels almost 100% car like to drive. There is almost no body roll, the steering is fast and communicative at all speeds. Front-end grip is great and then getting pushed out of the corners feeling are present despite the test car was four wheel drive. The launch is fuss and wheel spin free so it gets off the line very quickly and provides a lot of traction in all scenarios. Be it off the road or on the road. Brakes are good with excellent progression and bite feel from the pedal. Wheelbase is long but the nimble-ness and agility on offer is good enough too. Ride quality is compliant but there is the underlying stiffness to it. The BMW X3 is back and how. The best selling and popular SUV continues to get better and shows how important is for the manufacturer. Despite the X1, the X3 continues to do well already in the market. The lack of six-cylinder engines for now is a bit of niggle. A four-cylinder petrol is on offer though. However, the pricing is spot on and the package is compelling at this price point. Given the fact that we have driven every competitor in this class, we would still recommend the X3 as it is an true all rounder and fits our conditions just right.